Abbington Green Bed & Breakfast Inn, Asheville NC: Gardeners Note: Alliums Blooming at Our Asheville Bed and Breakfast! 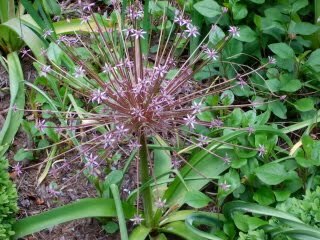 Gardeners Note: Alliums Blooming at Our Asheville Bed and Breakfast! I look forward to many aspects of the Spring season...you can probably tell that by the number garden-related notes that I post and the enthusiasm which I apply to each new bloom category. Well, not to disappoint you, here's another! 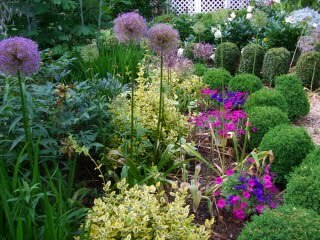 The gardens at this Asheville bed and breakfast are filled with a number of varieties of Alliums. Allium is quite a number of varieties of plants that are related to garlic. Some are quite small, that is less than a foot tall, while others are wonderous stand-outs above most of the Spring garden with blooms atop 40 to 48 inch tall flower spikes! Each year, over the past dozen or so years, I have added more Alliums to the gardens. They generally bloom at the very end of April through into June, depending on the variety. These photos show some of my favorites in my Asheville bed and breakfast gardens. 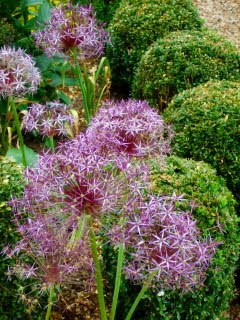 They include Allium christophii with its "green eyes" centered in lavender petals; very tall Allium Globemaster with its softball-size blooms, and my absolute favorite: the lower-growing but incredible Allium shubertii that looks like a huge fireworks explosion! After several weeks it dries out leaving a "skeleton" of the fireworks that can be spray painted silver or gold and used at Christmastime in a large bowl to decorate your home. Amazing!! Hope you enjoy the show!